With Hurricane Danielle disappearing into the North Atlantic, and Earl trying to decide where to go next, we have Fiona waiting in the wings as a threat to longer term activities in the Gulf. Those are moving forward slowly. 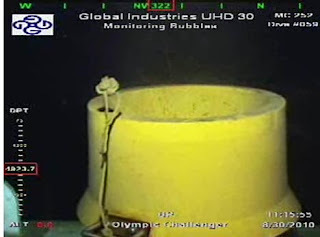 The current infrastructure over the well has been largely disconnected in preparation for switching the BOP and upper assembly for that which was on the second relief well. The equipment is all waiting, and usually starts to do functional things after midnight, but that is not happening at the moment, so perhaps we will have to wait for something to occur later on Monday morning, at which time I will upgrade this post. Bubbles coming out of the stack at 11:15 am. 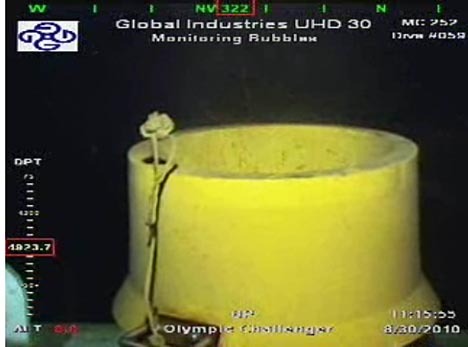 While there is a steady small stream of bubbles coming out of the stack, of unknown origin, and being monitored by the Oly - ROV2, the rest of the operation has been temporarily put on hold by the rough seas on site. Work will restart when it gets a bit calmer.